As expected, the U.S. Department of Agriculture announced Nov. 29 that it's halting an Obama-era plan to gradually reduce the amount of salt in school lunches each year. But the new plan would keep current sodium level targets unchanged through 2019. 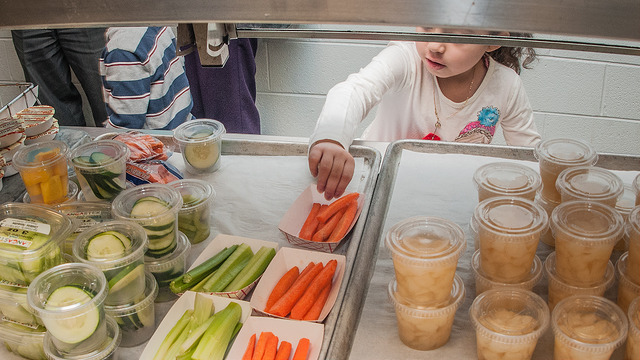 "Those targets are currently not more than 1,230 milligrams per meal for elementary, 1,360 mg for middle and 1,420 mg for high schools," Maria Danilova reports for the Associated Press. Margo Wootan of the Center for Science in the Public Interest said that the sodium levels now allowed are too high, and said the high-school sodium target is two-thirds of a child's daily recommended intake. "This is locking in dangerously high levels of salt in school meals," she told Danilova. The federal Centers for Disease Control and Prevention backs up this claim, saying that about 90 percent of school-age U.S. children eat too much sodium daily, and that 1 in 6 children have raised blood pressure (which can be lowered partly with a healthy diet that includes less sodium). Agriculture Secretary Sonny Perdue has criticized the sodium restrictions, saying that children won't eat the healthier meals and that food gets thrown away. USDA's Food and Nutrition Service is also keeping in place a program that allows school districts to opt out of a requirement to supply whole grains in lunches, if the schools feel they can't procure enough whole-grain products.